A pulmonary embolism (also known as PE) is a very serious medical emergency. It is a blockage in one of the arteries (blood vessels) in your lungs, usually caused by a blood clot. 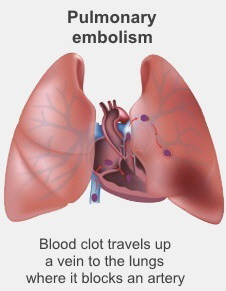 The most common cause of a pulmonary embolism is a deep vein thrombosis (DVT), a clot in one of your legs. Because a pulmonary embolism is very serious, if you have any of symptoms of a pulmonary embolism, especially if you have one or more risk factors, get immediate medical assistance – call an ambulance on 111. The symptoms you may experience with a pulmonary embolism depend on whether it's a large or small clot, and exactly where it is. Small pulmonary embolisms don't always cause symptoms. some blood conditions, such as high platelets. Your doctor will assess all your symptoms and risk factors and decide how likely it is that you have a pulmonary embolism. If it's possible you might have one, you will probably need to have a lung scan and maybe a blood test. Some people are admitted to hospital, others are managed at home. If the tests show you do have a pulmonary embolism you will most likely need to have blood-thinning medicines. Your GP may manage this treatment, with support from the Acute Demand, or they might refer you to the Haemostasis Service at Christchurch Hospital. Your doctor may suggest some tests to find out what caused your pulmonary embolism. If it was caused by a DVT they may suggest you wear compression stockings – although these aren't right for everyone. Some people may be at high risk of having another DVT or pulmonary embolism. If you are one of these people, you may be advised to continue taking blood-thinning medication, or to take it in circumstances where you might be at risk of another clot. In the future, always tell your doctor or nurse that you've had a DVT, even if you don't know if it is relevant to what you're being treated for. Detailed information about pulmonary embolism, including causes, symptoms, treatment, and prevention. Information about pulmonary embolism, including its causes and reducing your risk. Written by HealthInfo clinical advisers. Endorsed by clinical director, Haematology, Canterbury DHB. Last reviewed June 2015. Last updated March 2019.